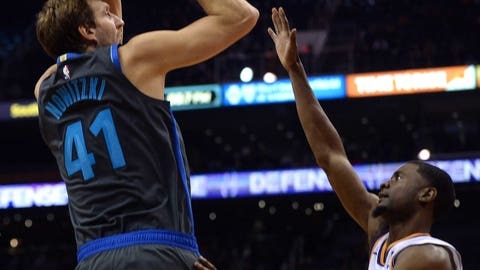 When the Dallas Mavericks play host to the Phoenix Suns on Tuesday night, the game will serve only as a vehicle for a Texas-sized sendoff for Hall-of-Fame-bound forward Dirk Nowitzki as he plays in what will likely be the final home game of his illustrious career. While the 14-time All-Star and sixth-leading scorer in NBA history has yet to officially announce that his 21st season will be his last, the Mavs are prepared to honor Nowitzki throughout the game with ceremonies celebrating his numerous career achievements. Mavs owner Mark Cuban, who purchased the franchise on Jan. 4, 2000, not long after Dallas made a draft-night deal with the Milwaukee Bucks to acquire the mostly unknown 7-foot teenager from Würzburg, Germany, in the 1999 NBA Draft, said the night is going to be emotional. Nowitzki was named NBA MVP after the 2006-07 season, a year after being rebuffed by Dwyane Wade and the Miami Heat in the NBA Finals. Five years later, Nowitzki, the lone superstar on the Mavs roster, defeated Wade, LeBron James and Chris Bosh in their first season together in Miami to win Dallas its only NBA championship. Nowitzki, who was brilliant that title season in sweeping Kobe Bryant and the two-time defending Los Angeles Lakers in the second round, and then beating Kevin Durant and the Oklahoma City Thunder in the Western Conference finals, was named NBA Finals MVP. “It’s been an experience that has been second to none, really on every level,” Mavs coach Rick Carlisle told reporters of coaching Nowitzki for the last 11 seasons. “From the tone that he sets every day to how he approaches the game, and how he enables his teammates to play better than they would otherwise because of how he affects the game. As for the game, Dallas and Phoenix have long been playing out the string. The Suns, who still need a win just to reach 20 wins on the season, will finish at the bottom of the Western Conference. Phoenix enters Tuesday’s game having allowed 70-plus points in the first half in consecutive games. The Suns rallied to win the first over an equally depleted and sub-.500 New Orleans team, but were clobbered 149-113 by the Houston Rockets on Sunday. Picking up a few pointers from Nowitzki couldn’t hurt.